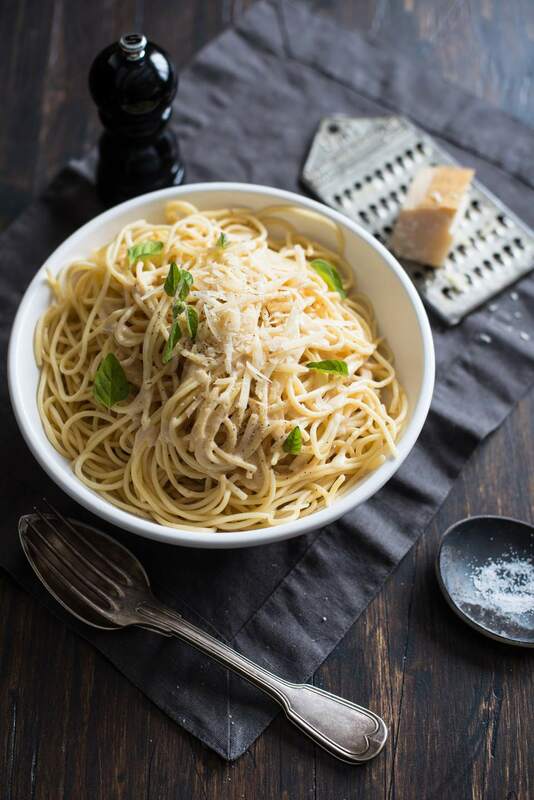 This super simple recipe for Pasta with Garlic and Cheese is almost not a recipe! It's kind of like a deconstructed pesto, using parsley instead of basil. Of course, you can use basil if you'd like. I wouldn't recommend using this amount of oregano or thyme ​because that would simply overwhelm the dish. But lots of basil is delicious. Whenever you cook pasta, it's important to have enough water. For a one-pound box of pasta, at least four quarts of water is needed. The pasta needs to be able to move freely within the pot so it doesn't stick together and so all of the noodles rehydrate evenly and at the same time. It's also important to cook the pasta to "al dente". This is a term Italians use to describe perfectly cooked pasta. It is tender but firm, with a slight bite. When you bite into the pasta and look at the center, there shouldn't be any white left, but there should be a shading to opaque in the middle of the strand. This recipe has to be served immediately when it's cooked. To make it even better, heat the plates in the oven before you add the pasta (be sure to use oven-safe plates!). Have the wine poured before you toss the pasta with the garlic mixture, and have a nice green salad on the table ready and waiting for you. The garlic toast should be in a napkin in a basket. Put the pasta on a heated serving plate and dig in.